The media and entertainment business is in turmoil. Revenues are struggling to outpace inflation, production and marketing costs are skyrocketing, the Hollywood blockbuster model is collapsing, broadcast TV is dying  everything from news to games to music to publishing is in the midst of massive change. However, what most perceive as signposts of disaster are really signposts of opportunity. The Information Economy is being replaced by a new Imagination Economy: a new global boom in which the rise of ubiquitous, natural, and affordable technology, the rise of participatory culture and the new 'maker' movement, the rise of a global broadband distribution platform with 5 billion users by 2016, and the rise of a rapidly growing global middle class converge to reshape the media and entertainment industries  and quite possibly every other industry as well. 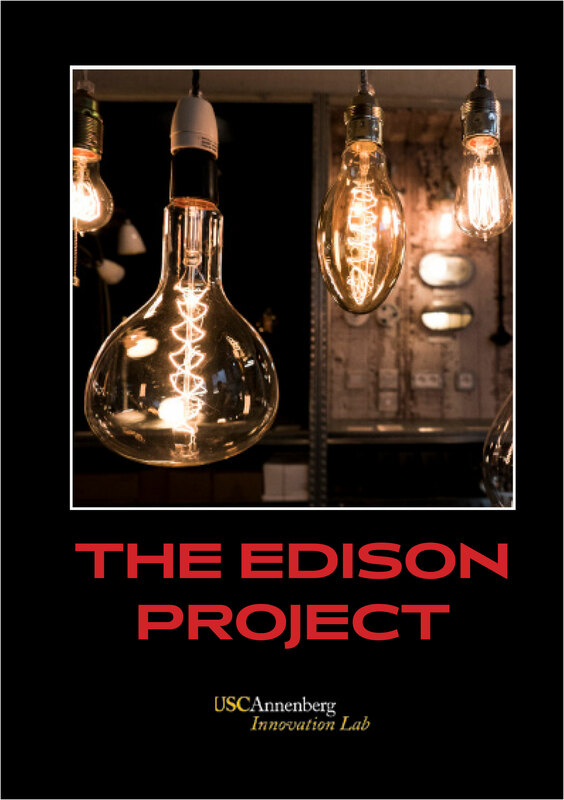 The USC Annenberg Innovation Lab's Edison Project explores how the new creators and makers, the new screens, the new metrics and measurement, the new funding and business models, and the new public spaces are all combining into a new ecosystem  and how media and entertainment companies can reorient themselves to flourish in this emerging Imagination Economy. My work in the project focused primarily on two pillars: The New Screens and The New Creators and Makers. I coauthored the chapter on The New Creators and Makers with my team of graduate student workers. As we described it, "The digital revolution supposedly provided the tools to create and distribute almost anything to almost anyone � however, those 'almosts' were huge. Now, sufficiently high-speed Internet connectivity is finally coming to rural areas and third-world countries, a new generation of distribution platforms are creating sustainable business models for even the most hyper-niche content and radically changing the relationships between audiences and creators, and makerspaces are bringing hardware prototyping and manufacturing capabilities to a vast range of nano-companies and startups. This chapter explores a number of questions surrounding the new creators and makers in this new media ecosystem. Who are they? Where are they? What do they make, and how do they make it? How will they compete and collaborate with the established 'traditional' media giants? What do they need to succeed? Applied research supporting this chapter included the Lab's New Creators & Makers Toolkit, and the Lab's Fall 2015 Think & Do in Chattanooga, Tennessee exploring how that city's super-fast Internet connectivity (the fastest in the United States) could revolutionize the lives of its citizens." 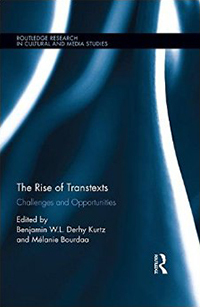 The overall book description: "This volume builds on previous notions of transmedia practices to develop the concept of transtexts, in order to account for both the industrial and user-generated contributions to the cross-media expansion of a story universe. On the one hand exists industrial transmedia texts, produced by supposedly authoritative authors or entities and directed to active audiences in the aim of fostering engagement. On the other hand are fan-produced transmedia texts, primarily intended for fellow members of the fan communities, with the Internet allowing for connections and collaboration between fans. Through both case studies and more general analyses of audience participation and reception, employing the artistic, marketing, textual, industrial, cultural, social, geographical, technological, historical, financial and legal perspectives, this multidisciplinary collection aims to expand our understanding of both transmedia storytelling and fan-produced transmedia texts." My chapter, "Creating Worlds in Which to Play: Using Transmedia Aesthetics to Grow Stories into Storyworlds," outlines the storytellers can adopt more game designer-style thinking and use transmedia aesthetics, specifically unique franchise characteristics and negative space, to expand their stories into vast transmedia mythologies by inviting others to come and play. Other chapters in the book are by Henry Jenkins, Sam Ford, Louisa Ellen Stein, Paul Booth, and a long list of other transmedia scholars. The overall book description: "The concept of world and the practice of world creation have been with us since antiquity, but they are now achieving unequalled prominence. 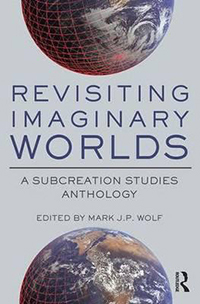 In this timely anthology of subcreation studies an international roster of contributors come together to examine the rise and structure of worlds, the practice of world-building, and the audience's reception of imaginary worlds. Including essays written by world-builders A.K. Dewdney and Alex McDowell and offering critical analyses of popular media such as Oz, Minecraft, Star Trek, and Battlestar Galactica, Revisiting Imaginary Worlds provides readers a broad and interdisciplinary overview of the issues and concepts involved in imaginary worlds across media platforms." My chapter, "A Thousand Stories in a Day: Building Rilao and Reimagining Lagos," co-authored with Laura Cechanowicz, Brian Cantrell, Alex McDowell, Jeff Watson, and Ann Pendleton-Jullian, describes the narrative design methodologies developed and utilized by USC's World Building Institute and the World Building Media Lab, and how they were implemented for two massive worldbuilding projects, The Rilao Project and Dry City. The Playful Thinking Series was sparked by discussions and research being conducted at the MIT Game Lab (then the Singapore-MIT GAMBIT Game Lab), a research group at the MIT Comparative Media Studies program. The series' co-editors are myself, Mia Consalvo, Jesper Juul, and William Uricchio, working with Doug Sery at MIT Press. Transmedia narratives use a combination of Barthesian hermeneutic codes, negative capability and migratory cues to guide audiences across multiple media platforms. This thesis examines complex narratives from comics, novels, films and video games, but draws upon the transmedia franchises built around Jim Henson's Labyrinth and The Dark Crystal to provide two primary case studies in how these techniques can be deployed with varying results. By paying close attention to staying in canon, building an open world, maintaining a consistent tone across extensions, carefully deciding when to begin building a transmedia franchise, addressing open questions while posing new ones, and looking for ways to help audiences keep track of how each extension relates to each other, transmedia storytellers can weave complex narratives that will prove rewarding to audiences, academics and producers alike. As we move past the "Transmedia 101" stage of definitions and early experiments, the next stage of development for transmedia experiences is the creation of transmedia criticism. Such a move is not without its challenges. Some troubles facing this evolution include how transmedia criticism is inherently difficult (Should transmedia criticism only focus on transmedia's unique characteristics? Should it evaluate how well each individual component performs as an example of its medium? Must a transmedia critic be 'fluent' in every medium in a franchise? ), and how unleashing a horde of vicious critics on a medium still in its infancy could be horrifically damaging. Finally, there's the question of where such criticism might ideally begin, as such criticism is likely to evolve in three distinct directions - first in an industry-educating role like that of E.W. Sargent in the early days of cinema, second in an "educate the public sphere" role like that of early literary criticism in 18th-century England, and third in the lonelier role of isolated education to which literary criticism eventually found itself exiled. Despite these issues, the development of a robust system of transmedia criticism will be well worth the difficulty. As the future of entertainment becomes increasingly dominated by transmedia experiences, the entertainment industry will require both more informed practitioners (who will need both insights into leading transmedia experiences and a shared language of transmedia akin to the language of cinema) and a broader audience for transmedia as a medium (who will ways to find out about new transmedia experiences and to determine which such experiences are worth their time). All of these breakthroughs can be attained through a robust transmedia criticism. Book Review: Jeet Heer and Kent Worcester, eds. A Comics Studies Reader. "With A Comics Studies Reader, editors Jeet Heer and Kent Worcester (leading comics scholars themselves) aim to paint a portrait of the field targeted at a broad academic audience. As they write in their introduction, 'While the present collection is designed for use in courses on comics, it is also aimed at readers who are curious about where comics sit in relation to other kinds of materials that might usefully be assigned in art history, communication arts, design, history, literature, political science, and sociology'. "...In its current incarnation, the book would make a fine addition to the syllabus of any comics studies course. As it stands, however, it is not in itself an ideal introduction to comics studies, or sufficient as a primary textbook for such a course. A second edition, revised to include samplings from McCloud, Kochalka, and Eisner, an appendix or richer online companion list of resources telling interested readers where to go next (such as conferences, mailing lists, scholarly publications, suggested texts, university programs; the introduction makes some passing references, but more explicit resources would be useful), and a general easing up on the 'comics are valid!' hand-wringing could make such an edition an invaluable text. Here's hoping we get one." The influence of her fellow travelers can be felt in much of her output, as a trees-meets-tech, sweet-meets-sinister vibe runs through her work. Most of Keating's pieces start simple, but build to a kind of all-encompassing, all-enveloping tide of sound. For example, "Exurgency", the opening track to her first solo EP One Cello x 16 (2004), opens with a wavering high line that suggests that we're headed for something akin to "Flight of the Bumblebees", but then Keating brings in an additional layer of darkly insistent notes, followed by another and another until it feels like something's got to give  and when it does, when the song bursts into its next stage at the 1:58 mark, it tumbles suddenly into a softer place with quieter, regular notes like heartbeats for about twenty seconds before reintroducing an insistent, more energetic over-line, all the while being accompanied by a thrumming, sparse bass line that adds an almost sinister undercurrent to the whole thing. The mental image it conjurs up is evocative of childbirth followed by (or perhaps accompanied by) alternating senses of menace and peace, but with a recurring superpattern over the lot that eventually builds up to an ascending sweetness, perhaps suggesting some kind of transcendance before returning touches of the beelike insistence from the piece's beginning. It's fascinating to watch a new medium gathering its legs beneath it. First it needs to figure out what unique characteristics it has to offer over well-established media like film or television, then determine what characteristics it will keep from its ancestors and what it will cast aside, and finally discover how to use the resulting combination of old and new to create really memorable stuff. Early films and television shows were frequently recordings of stage acts, and early CD-ROM games were often little more basic interactivity grafted onto bad B-movies. Today's new "new media" almost all arise from one common question: how to use the twin developments of cheap, ubiquitous video devices and the Internet to tell stories in new, interesting and hopefully profitable ways. Among the most common of these new forms are webisodes (online-original shows like Joss Whedon's Dr. Horrible's Sing-along Blog) and mobisodes (shows designed explicitly for consumption on mobile devices like the 24 spinoff 24: Conspiracy). The latest contenders to emerge, and perhaps the most interesting to comics fans, are motion comics. This new imprint combines the digerati DIY mentality with the marketing and distribution prowess of an established publishing juggernaut, minus the stigma of a print-on-demand system or vanity press. The 'shorter works' description sounds about right, as one personal draw of John Maeda's latest book SIMPLICITY is its being only 100 pages, and my own first novel currently weighs in around only 60,000 words. The 'lower price' feature also sounds about right as $20 for a slim hardcover feels like a fairly palatable price point, especially when dropped to $12-$14 after the 30%-40% discount usually offered by retailers like Amazon. The license model also feels like its time has come, and I myself would happily offer additional content, like additional chapters or multimedia materials, on my website for licensed users -- which is not entirely dissimilar from what C3 head honcho Henry Jenkins did with his outtakes from Convergence Culture. Divergences: Something in the Air? A two-part summary of the top 10 action points based on my Master's thesis on transmedia storytelling. Now that the vast majority of the market already carries a cell phone, cellular phone carriers are turning to mobile media as a possible engine for growth. This new emerging market offers an exciting opportunity not just for carriers but for content providers as well  the question is how to develop it. Some of the roadblocks currently facing widespread mobile media adoption include expensive phones, expensive plans, and expensive episodes. Some of these barriers will drop as technology advances, but proponents of mobile media should consider alternative methods to broaden their markets, including delivering content through podcasts or subsidizing mobisodes through advertising or product placement. Early assumptions about mobile media also need to be questioned  duration need not be constrained to only a few minutes if the content is truly compelling, and most content need not be reframed if the screen is of a high enough quality. While repurposing existing content is often sufficient (and welcomed by consumers), content developed exclusively for the small screen should mind the features and constraints of the media form, including location awareness, the ability to communicate with other mobile devices and (of course) portability. Storytellers should also carefully consider whether to develop a new franchise or extend an existing one through transmedia storytelling. If attempting the latter, the early mobisode experiment 24: Conspiracy serves as a cautionary tale by demonstrating the importance of using existing characters, having an impact on a larger storyline, allowing sufficient time to develop the story and having an adequate budget. Mobile media offers new, rich opportunities for both creative and commercial development. However, the key to success in mobile media is the same as in every other media form: telling the best possible story to the widest possible audience.